Staking the North: The Arctic is being developed—in whose interest? MONTREAL—On March 28 Indigenous leaders and environmental activists called for a moratorium on Arctic oil and gas exploration, as Foreign Affairs Ministers from Canada, Norway, Denmark, Russia and the United States met at the “Arctic Summit” in Chelsea, Quebec to discuss their plans for the resource-rich North. Canada has acknowledged its interest in metals, oil and gas in the Arctic, which the melting sea ice is opening up to exploration. But critics are expressing concerns about the impact of Arctic industrialization on Indigenous peoples and the climate. 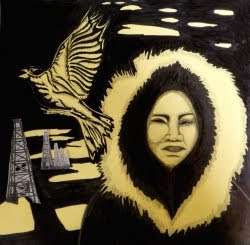 The Indigenous Environmental Network (IEN), the Alaska-based Resisting Environmental Destruction On Indigenous Lands (REDOIL) and the Council of Canadians travelled to the Arctic Summit to deliver their appeal for a moratorium on oil exploration. According to a joint press release issued by the IEN, REDOIL and the Council of Canadians, 90 billion barrels of recoverable oil and 1,670 trillion cubic feet of natural gas have been discovered in the arctic. Clayton Thomas-Muller of IEN is concerned that talk of developing oil and gas reserves in the north is just part of a larger initiative to exploit the world’s remaining natural resources. “The Arctic development plan is part of an ongoing psychotic initiative lead by the G8/G20 nations to exploit the world’s last remaining pristine ecosystems for energy [and] for raw resources,” explains Thomas-Muller. According to past communiques, G8 meetings have explicitly encouraged the development of new oil reserves. A new resolution to phase out G20 country subsidies to oil companies was passed at a G20 meeting last September but the resolution lacked any time-frame for action. Thomas-Muller was also concerned by the lack of Native representation at the Arctic Summit considering the difficulties Inuit people face as a result of oil and gas exploration. Inuit have observed changes in animal populations and behaviour, thinning sea ice and unpredictable weather patterns. An Inuit hunter was stranded in January when the ice floe he was on broke off and started to drift in the Northwest Passage. Ongoing explorations in Nunavut are going after nickel, diamonds, sapphires, uranium, gold, silver and other metal deposits. The exploratory process may also adversely affect caribou herds on which Inuit depend for sustenance. According to the Beverly and Qamanirjuaq Caribou Management Board (BQCMB), caribou populations suffered a “major population decline” since 1994. A 2004 position paper published by the BQCMB suggests that increasing demands for caribou, effects of climate change, and infrastructural and industrial development on caribou ranges—including exploration—are the major contributing factors to this decline. Incidentally, food harvesting rights and land use planning with consideration of health, housing, education and other social services are guaranteed to the Inuit people of Nunavut, according to the 1993 Nunavut Land Claims Agreement (NLCA). This agreement concurrently handed over immense swaths of land in modern-day Nunavut to the Crown. G7 Finance Ministers met in Iqaluit, Nunavut, in February. Some speculated that Canada’s recent strategy of promoting “Arctic Sovereignty,” including Canada’s staking of subsurface rights to the Arctic seabed and control over the disputed Northwest Passage, played a role in the choice of location. The Harper government has bolstered its talk of Arctic Sovereignty through its “Arctic Strategy,” and, since 2007, has announced $3.1 billion in military spending for infrastructure development, annual military training exercises in Nunavut and the creation of the Canadian Northern Development Agency (CanNor). Since the signing of NLCA Canada has been handing out exploration permits within the territory. Mining companies have invested at least $700 million in exploration in the territory since 2007, according to Nunavut Minister of Economic Development and Transportation Peter Taptuna. Meanwhile, critics have accused Canada of not fulfilling its obligations under the NLCA. The Nunavut Tunngavik Inc. (NTI) is suing the federal government for $1 billion for breach of contract and breach of fiduciary obligation. NTI would not elaborate on the ongoing court case. A judicial review of the NLCA produced a number of suggestions which the federal government dismissed as being too costly. The announcement for $3 billion toward military infrastructure in the Arctic was announced less than a year later. Shailagh Keaney is a writer based in occupied Atikameksheng Anishnawbek territory. This story was published in The Dominion’s special issue on the G8 and G20 summits in Ontario. We will continue to publish independent, investigative news about the G8 and G20 throughout the month of June.